We offer a variety of jewelers tools to help make work a breeze. It is our commitment to the ancient craft of jewelry that inspires g&jtools.com, a url that links to our jewelry website, gregoreandjennifer-rabe.com. Go to G&J Tools on the header to see our products and accompanying videos on how to use them. There are tools that we invent out of necessity and then there are those inspired by our friends. Enjoying the Tucson gem show with friends, Heath London and Christine and Bruce. The joys of a life well lived is the result of pulling together and drawing out all of the good from our past experiences, whether like myself, Jennifer-Rabe having been raised in Spain, or Gregore in Canada, and all of our travels, interests and friendships. Whether we are designing engagement rings or other fine jewelry in Santa Barbara, we are inspired by our entire lives. Jim approached us to make diamond earrings for Sandy to celebrate the big 60. Jim is a stone cutter/faceter so we started the design by meeting with him to look over his stash of cut and loose stones. He was prepared to cut something new for this special occasion. He had to be really careful to meet with us when Sandy thought he was somewhere else because she is clever and therefore attentive to his coming and going from home. When we started these earrings we were sure that David, DGG, would appreciate their simplicity, making the rubies the stars. His stones are particularly beautiful. They are clean, bright and beautifully cut. After the drawing was approved we threw it into CAD so we could size the design precisely to his stones. Santa Barbara, California, Jewelry Designer Gregore Morin has won his 19th American Gem Trade Association(AGTA) Spectrum Award. The AGTA Spectrum Awards™ is considered the most respected and prestigious creative award for 15 categoriesof the jewelry industry. 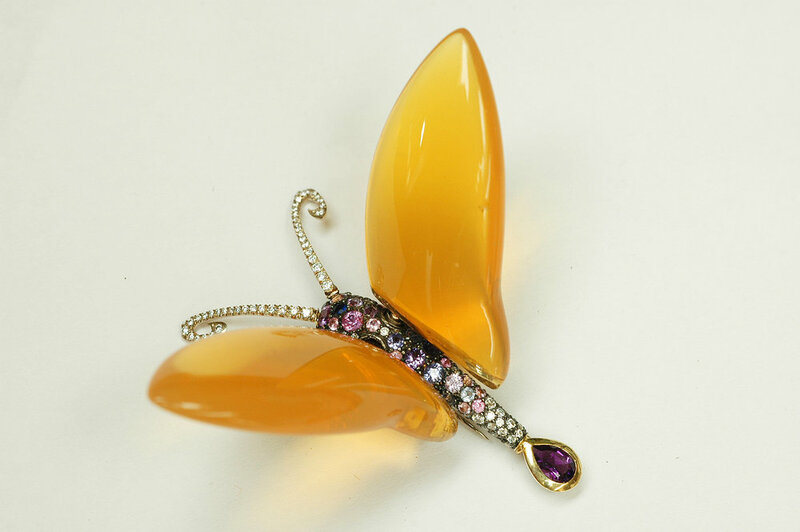 Debuting in 1984, Spectrum Awards has honored and recognized designers whose work promotes the artistic useof naturally colored gemstones and cultured pearls in fine jewelry design. Everything Japanese is a passion in our household. 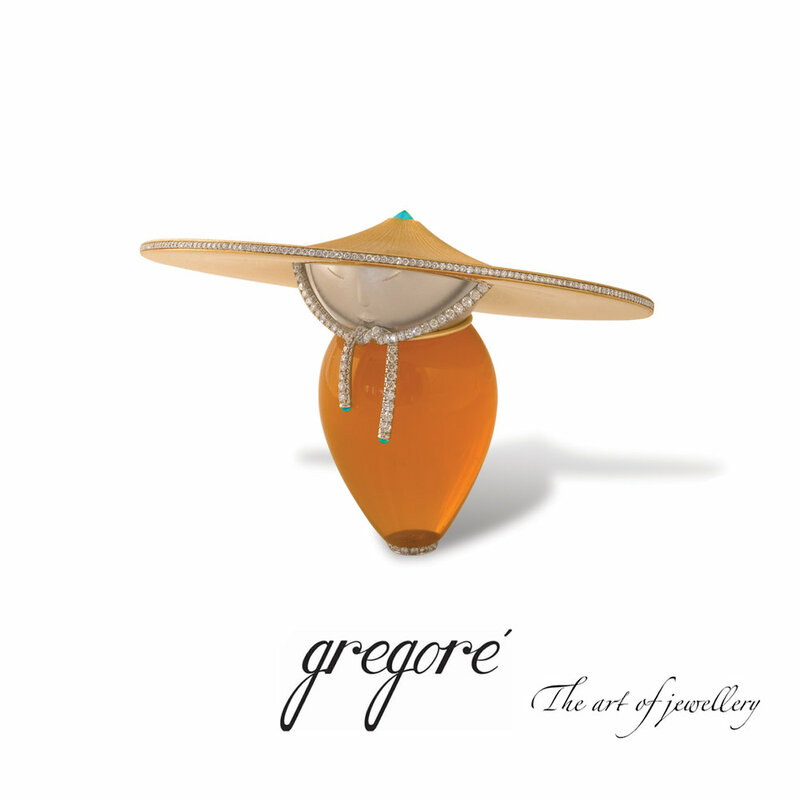 Gregore in particular has been very focused on making Asian themed Jewelry. Why you ask? because it is refined, detailed, balanced, and entranced with nature and all things made. The Ebony wood bead-like forms are an early phase of the earrings. He carved the Ebony wood with CNC because the detail and precision, is painfully expensive if not.